Chris Marlowe is one of America's most versatile television sports broadcasters. He has been the Denver Nuggets television play-by-play voice since 2004. 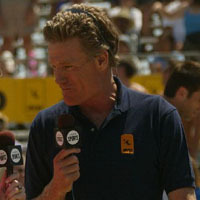 A veteran of five consecutive Olympic telecasts on NBC, Marlowe called play-by-play for NBC's coverage of Beach Volleyball at the 2004 Summer Olympics in Athens, Greece. Marlowe also has done AVP events for NBC, college volleyball for CSTV, and volleyball, football and basketball for ESPN. He began as a two-sport standout at Pacific Palisades High School in Los Angeles, California. Marlowe went on to play basketball and volleyball at San Diego State University (SDSU) and was the starting setter on SDSU's only NCAA Championship team - the 1973 men's volleyball team. In 1976 and 1978, he was voted the Most Valuable Player by USA Volleyball. On the beach, Marlowe won eight tournaments, including the 1977 World Championship and two prestigious Manhattan Beach Opens. Marlowe's athletic career culminated as captain of the gold medal-winning United States Olympic Volleyball team in 1984. The athletic honors continued with his induction into both the San Diego State Aztec Hall of Fame and the California Beach Volleyball Hall of Fame in 1994.